Vigilant Adalvald is a Nord Vigilant of Stendarr, first mentioned by Vigilant Tolan during the first Dawnguard quest. He is later found in Dimhollow Crypt on your first mission as a member of the Dawnguard. When you find him, he is being interrogated by the vampire Lokil, but dies without revealing anything. 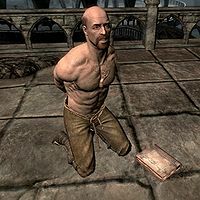 By his corpse you can find a segment of his notes on the crypt, detailing its connection with Skyrim's ancient vampiric clans. He wears ragged trousers, either steel cuffed boots or steel plate boots, and an Amulet of Stendarr. His hands are tied with prisoner's cuffs. He also carries a random book. He knows the spells Oakflesh, Healing, and Lesser Ward. Upon death, Adalvald will say, "Peace at last..."
His death is scripted and there is no way to save him. This page was last modified on 8 November 2013, at 14:24.